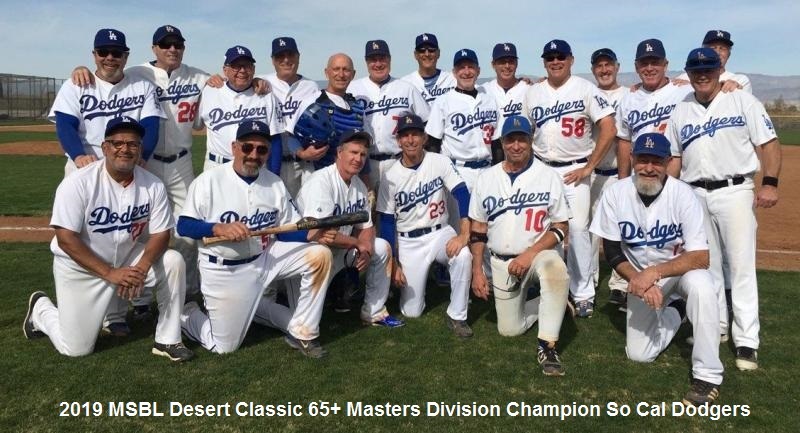 The So Cal Dodgers prevailed over a tough Mudcats team, 16-8 in the championship game of the 65+ division on a sunny weekend in Palm Springs at the 2019 MSBL Desert Classic. Along the way, the Dodgers made it to the playoffs undefeated but so did a very good Mudcat team. Both teams had played to a 5-5 tie that resulted in the ‘least runs allowed’ tiebreaker favoring the Dodgers, who grabbed the top seed. The game was notable for a 5-run comeback by the Dodgers in the late innings, made possible through some timely hitting, great defense and the dogged determination of “young” Tommy Ebert keeping the Dodgers in the game with his shutdown relief pitching. 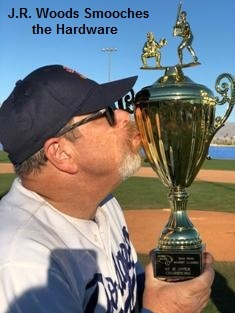 The Dodgers proceeded to the Championship game where they prevailed over a dogged but tired Mudcat squad behind the pitching of Ebert and Schneidermann. Rick Rubin, Rick Breitinger and D R Keys also helped pitch the Dodgers to victories in pool play. I credit much of the pitching success to the strong performances behind the plate by Valenzuela, Woods and Roman. Our pitchers had real good command and our defense made the plays behind them. The things that kills you are walks and errors so we tried to minimize that as much as possible. All of our players competed at the plate and came through with key hits with men on base. That made my life easy. There were a lot of hitting stars, as the Dodgers averaged more than two runs an inning for the weekend. The offensive support was distributed throughout the lineup with notable hitting performances turned in by Lance Parker, Albert Ulibarri, Woods, Schneiderman, Mark Freeman, Steve Lapin, L. Cohen., Marc Axelrod and Jack Sills. Big hits in the championship game also came off the bats of Ted Tannenbaum and Steve Green. Defensively, the old vet, Dave Cripe, anchored down second base beautifully and Ulibarri, Parker and Vic Reskin handled most of the infield duties. 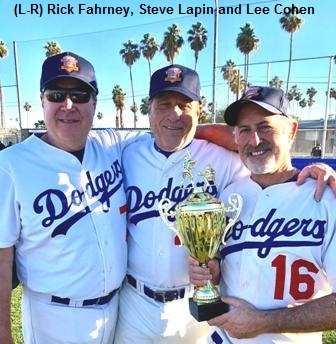 All of this resulted in continued success in Palm Springs for the Dodgers who played in their eighth consecutive championship game and won their fourth title.